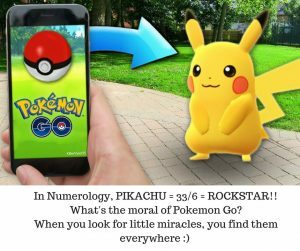 HomeNumerologyPokemon Go Numerology – When You Look for Miracles, You Find Them! Pokemon Go Numerology – When You Look for Miracles, You Find Them! -CREATOR (Pokémon reminds us that we are responsible for how our lives turn out – the game also gives us a chance to ‘play God’). -MOUNTAIN and WATERFALL (Pokémon reflect the value effort – just as landforms take years to develop, it takes time to carve out your niche in society – 35/8 lifepath people are self-made leaders). -SPIDER (a powerful totem animal, reminding us that fortune blesses those who prepare for, and jump on, opportunities). What incredible numbers for success. No wonder Pokémon has become an empire. When you study 8 lifepath’ers (like numerology author Dan Millman and Donkey Kong creator Shigeru Miyamoto), you realise that ‘in life, there’s no free lunch, but if you work hard, your legacy could save lives’. The number 8 looks like an infinity symbol connecting Heaven and Earth – it’s about karma. 8 depicts a racetrack, i.e. ‘what goes around, must comes around’. Pokémon reminds us that happy people are courageous and playful. It teaches us to cooperate with others (animals, nature spirits and elementals) to elevate the planet. Cool, huh? Who knows how many kids have made it through difficult childhoods by playing video games? I used to play Atari and Sega, to cope with bullying. Being Sonic the Hedgehog was one of the only times I felt powerful as a kid. I also loved Civilisation on the PC, which teaches you about politics and conflict. As someone with lots of 9 numerology (like many children born from 1980-1999), I feel like an Old Soul and tend to live in my head. It’s easier for me to learn from books and games than from people, especially when I’m stressed. 9 is a know-it-all number, which can be prone to depression. Kids with many 9’s lock themselves in their rooms after fights, so they can decompress and think. They benefit hugely from music and physical movement, which ties in with the section below. POKEMON GO adds to 48/12/3, the vibration of words like EXTROVERT and INTENTION. How perfect that it inspires people to exercise, socialise and see the world? I’m sure that Spirit will use the game to communicate with us, at least occasionally (read more on computer/ Spirit signs). Perhaps our Guides will place Pokémon in places we need to go, in order to meet those who will become our friends, teachers or partners? Pokémon Go gives us a chance to lighten up and see reality as a game, instead of Groundhog Day. It reminds us that ‘when you look for little miracles, you find them everywhere’. Satoru Iwata, is the late CEO of Nintendo, who brought Pokémon to the West. Satoru was a Master 33/6 lifepath (Master Healer). Find your lifepath here. 33/6 energy is about giving birth to new ideas, in order to bring people together. Every 33/6 I know (including my late friend Butterfly) either runs a spiritual business, and/ or is a public figure! A wave of them arrived over the past 50 years, but almost none will be born for decades to come. Amazing huh? Some people, including myself, believe that those with 33 energy (in their lifepaths, names etc.) are Starseeds who bring insights from other dimensions to Earth. Your lifepath age is always a turning point – in Satoru’s case he was promoted to the CEO of HAL Laboratory at age 33, where he proceeded to “turn the company around from its ¥1.5 billion debt and stabilize its finances within six years” according to Wikipedia. This came after much personal struggle – his father didn’t speak to him for six months after he joined HAL. Note the repetition of 6 throughout his life? This is common with your lifepath number – as a Master 11 lifepath, I see 11:11 and 11’s all the time! It’s my Soul’s way of keeping me on track. How interesting that Pokémon Go was publicly revealed two months after Satoru’s death. Perhaps it was his last gift to us? Numerology is uncannily accurate for predicting personality and spiritual turning points. For example, Pokémon composer and producer Junichi Masuda is a 28/10/1 lifepath (Action Hero/ Pioneer). At his lifepath age of 28, he helped create Pokémon Red and Blue, the first video games in the series. PIKACHU adds to 33/6 in numerology, the same as words like TEACHER and ROCKSTAR. No wonder is the most famous character!33/6 was the vibration of Satoru Iwata’s lifepath, mentioned earlier. Like all 151 Pokemon, Pikachu was designed by Ken Sugimori, a 32/5 lifepath (The Rebel), who shares a birthday with me. 5 lifepaths are extremely creative, due to their active Throat Chakra. Pikachu was the first Pokémon who chose not to evolve, because he wanted to show that small characters could defeat larger ones. He also uses electricity (or spiritual power) to zap his enemies*. What a great David and Goliath analogy. *Previously, when I did psychic development, I zapped my friend with white light! We all carry great power and knowledge within, it just takes patience to bring forth. I hope you’ve enjoyed this look at Pokémon numerology. You can find Spirit in anything, even a mobile app, when you look deeply enough.